"There is no doubt he is our friend," Turkey's prime minister, Recep Tayyip Erdoğan, says of Iran's president Mahmoud Ahmadinejad, even as he accuses Israel's foreign minister Avigdor Lieberman of threatening to use nuclear weapons against Gaza. These outrageous assertions point to the profound change of orientation by Turkey's government, for six decades the West's closest Muslim ally, since Erdoğan's AK party came to power in 2002. Three events this past month reveal the extent of that change. The first came on October 11 with the news that the Turkish military – a long-time bastion of secularism and advocate of cooperation with Israel – abruptly asked Israeli forces not to participate in the annual "Anatolian Eagle" air force exercise. Erdoğan cited "diplomatic sensitivities" for the cancelation and Foreign Minister Ahmet Davutoğlu spoke of "sensitivity on Gaza, East Jerusalem and Al-Aqsa mosque." The Turks specifically rejected Israeli planes that may have attacked Hamas (an Islamist terrorist organization) during last winter's Gaza Strip operation. While Damascus applauded the disinvitation, it prompted the U.S. and Italian governments to withdraw their forces from Anatolian Eagle, which in turn meant canceling the international exercise. As for the Israelis, this "sudden and unexpected" shift shook to the core their military alignment with Turkey, in place since 1996. Former air force chief Eytan Ben-Eliyahu, for example, called the cancelation "a seriously worrying development." Jerusalem immediately responded by reviewing Israel's practice of supplying Turkey with advanced weapons, such as the recent $140 million sale to the Turkish Air Force of targeting pods. The idea also arose to stop helping the Turks defeat the Armenian genocide resolutions that regularly appear before the U.S. Congress. 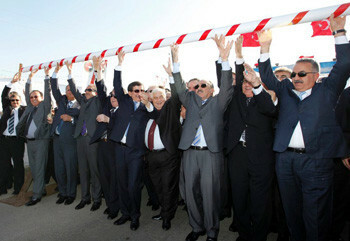 Ministers of the Turkish and Syrian governments met on Oct. 13 at the Öncüpınar border crossing and symbolically lifted a bar dividing their two countries. Barry Rubin of the Interdisciplinary Center in Herzliya not only argues that "The Israel-Turkey alliance is over" but concludes that Turkey's armed forces no longer guard the secular republic and can no longer intervene when the government becomes too Islamist. The second event took place two days later, on October 13, when Syria's Foreign Minister Walid al-Moallem announced that Turkish and Syrian forces had just "carried out maneuvers near Ankara." Moallem rightly called this an important development "because it refutes reports of poor relations between the military and political institutions in Turkey over strategic relations with Syria." Translation: Turkey's armed forces lost out to its politicians. Thirdly, ten Turkish ministers, led by Davutoğlu, joined their Syrian counterparts on October 13 for talks under the auspices of the just-established "Turkey-Syria High Level Strategic Cooperation Council." The ministers announced having signed almost 40 agreements to be implemented within 10 days; that "a more comprehensive, a bigger" joint land military exercise would be held than the first one in April; and that the two countries' leaders would sign a strategic agreement in November. 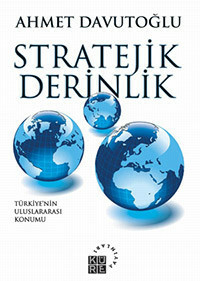 The cover of Ahmet Davutoğlu's book, "Strategic Depth: Turkey's International Position." The council's concluding joint statement announced the formation of "a long-term strategic partnership" between the two sides "to bolster and expand their cooperation in a wide spectrum of issues of mutual benefit and interest and strengthen the cultural bonds and solidarity among their peoples." The council's spirit, Davutoğlu explained, "is common destiny, history and future; we will build the future together," while Moallem called the get-together a "festival to celebrate" the two peoples. Bilateral relations have indeed been dramatically reversed from a decade earlier, when Ankara came perilously close to war with Syria. 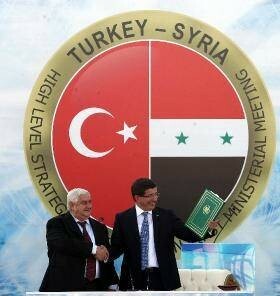 But improved ties with Damascus are only one part of a much larger effort by Ankara to enhance relations with regional and Muslim states, a strategy enunciated by Davutoğlu in his influential 2000 book, Stratejik derinlik: Türkiye'nin uluslararası konumu ("Strategic Depth: Turkey's International Position"). In brief, Davutoğlu envisions reduced conflict with neighbors and Turkey emerging as a regional power, a sort-of modernized Ottoman Empire. Implicit in this strategy is a distancing of Turkey from the West in general and Israel in particular. Although not presented in Islamist terms, "strategic depth" closely fits the AK party's Islamist world view. As Barry Rubin notes, "the Turkish government is closer politically to Iran and Syria than to the United States and Israel." Caroline Glick, a Jerusalem Post columnist, goes further: Ankara already "left the Western alliance and became a full member of the Iranian axis." But official circles in the West seem nearly oblivious to this momentous change in Turkey's allegiance or its implications. The cost of their error will soon become evident. It marked the first time Turkey's governing Justice and Development Party (AKP) let its increasingly anti-Western rhetoric spill into its foreign policy strategy, and the move may suggest that Turkey's continued cooperation with the West is far from guaranteed. 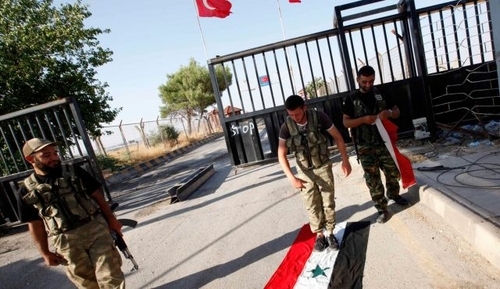 July 25, 2012 update:The Turkish government today closed its borders with Syria except for refugees fleeing that country, quite completely reversing the policies celebrated less than three years earlier. Stomping on the Syrian flag at the Turkish border with Syria.